Leaving a Voice Message 101: In this course students will learn to wait for the beep, to state their name, and to leave a NUMBER WHERE THEY CAN BE REACHED! Someone doesn't want their dog back. 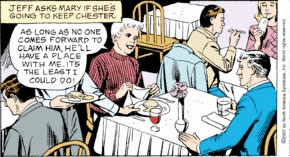 So I am pleased to announce the First Ever Mary Worth and Me Not-A-Real-Contest: If Chester could think, what would he be thinking in panel two above? Give it your best creative effort. The winner of this Not-A-Real-Contest will receive bragging rights and be able to pick a new song for our Charterstone Juke Box. I'll announce the winner on January 2nd! *Note: This Not-A-Real-Contest is not a real contest. Oh, my stars. He chews one scarf and barks at a chihuahua and suddenly Mary is filled with doubt about her capacity to care for the dog she stole. Mary, I'm not fit for dog ownership either, and our dog chewed everything and puked all over the house on a daily basis! And, again, what is it with your right buttocks? You are really fixated on it. So much so that you're starting to draw unwanted attention from the leader of the Vipers there. If I didn't know what you were thinking, I'd say you were coming on to him. And I don't think he has the same power that I have to read your thought balloons. That's right, Mary. Chester doesn't really belong to you... oh, wait. That's not what you mean. 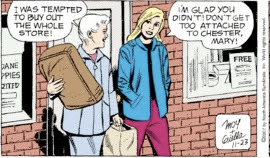 You're dismayed that Evil Mary Worth has blamed you for the altercation. 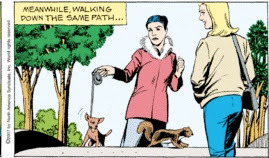 Well, Mary Worth, I'm sure once your Evil Twin is done meddling in your life, you'll be blamed for a whole lot more than just getting your leash tangled. And, Mary, what the heck is wrong with your buttocks? I don't mean to pry, but is it an Old Lady Thing? Because suddenly, it seems to be throbbing. 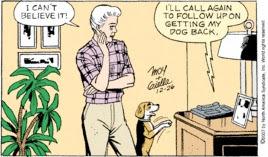 This panel proves that the laws of physics no longer apply in Santa Royale, California, and I'm more convinced than ever that time and space have conspired to introduce Evil Mary Worth and her little chihuahua to Charterstone from a nearby parallel universe. Because Mary and her evil doppelganger are dressed so similarly (if you look closely you can tell them apart because Mary is wearing slacks, and Evil Mary is wearing a skirt), I'm sure the switch will play out much as it did in Start Trek, Season 1, Episode 5: "The Enemy Within." Heaven help Dr. Jeff Corey. I've been struggling all morning to comprehend this panel. Mary apparently attempts to restrain Chester from barking silently at the chihuahua. Meanwhile, Mean Lady recoils her retractable leash and dangles her dog in the air like some sort of doomed piñata. I can see a number of ways this story line will develop, but they all end up with Mary baking a pie. Edited to add: And who is this dark-haired lady? Could it be Evil Mary Worth from a parallel universe that has suddenly crossed through the time-space continuum? In our dimension, Charterstone is a simple condominium apartment building full of bumbling simpletons. In the other, Charterstone is an asylum for the insane, and Evil Mary Worth is some sort of Nurse Ratched who rules the roost with electric shock therapy instead of tuna casserole. 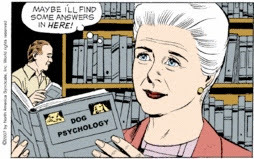 Is Mary Worth about to take on the timely topic of dog fighting? To learn the facts on this cruel blood sport, click here. Now you'll be informed as you enjoy the next few weeks of Mary Worth. Don't get too excited about this blatant attempt at foreshadowing. In Santa Royale, adventure can be used to describe many things. Barking at a cat. Observing a bird in its nest. Making a new friend at the park. What we shouldn't expect is Mary Worth abducted by jewel thieves who throw her down an abandoned mine shaft where she discovers a lost treasure and then is rescued from rising subterranean waters by Chester at the very last moment. Okay, so I was wrong about the sofa color, but Chester is on the couch, and he does talk: "Woof." Mary is actually reading out loud to her dog. I love that Mary has managed to meddle while deferring her authority to the experts, whose pictures I presume are on the back cover of her book. Spot and Boots (of animal hospital bequest fame) are the leading dog psychology experts. They wrote the book, so to speak. Woof. Whew - one copy left! 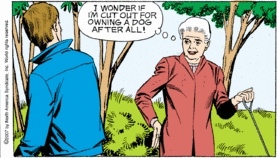 And thus Mary Worth brings meddling to a whole new level. Animal meddling. Today's strip is the funniest strip in the paper! I laughed and laughed. And I can't wait to see Chester lying on Mary's fuchsia sofa whimpering about his puppyhood. Or it could be that Chester IS A DOG!! Dogs destroy stuff all the time. 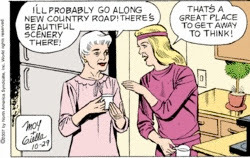 Get used to it, or take him back to New Country Road and leave him there, which (if I'm reading Mary's expression in panel two correctly) is exactly what she plans to do. 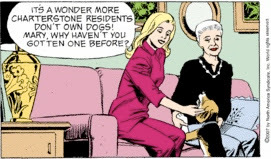 Could it be that Mary is finally beginning to think the dog might be happier with its REAL owners instead of trapped in her clutches at the Charterstone Condominium? This will teach Mary to run off with Dr. Jeff Corey and leave Chester the Dog behind. Never again, Mary Worth, never again. Judging by the fish skeleton on his plate, it is clear that the waiter has eaten the first fish off the wall and is going after the second. "Yes, all the people you advise... like One Fish, Two Fish here." I always assume when the word balloons are coming through a window, that the people are talking so loudly that they can be heard outside. I love that Jeff and Mary are shouting about a dog in a restaurant. Jeff, deal with it. Mary loves the dog more than you. And she doesn't care what you think. Dear Readers, please fight to keep Mary Worth in the Salt Lake Tribune. I expect all four of you to take this survey! She's been killed in the Washington Post, the Houston Chronicle, and several others! Why? Why? It's the funniest strip in the paper! Take the survey. You can vote for a new comic, and your three least favorite. Leave a comment begging them to keep Mary! "Since Chester has come into my life, Dr. Jeff Corey, you mean as much to me as this insignificant waiter whom I have callously ensconced behind my word balloon. Get used to it, Second Fiddle." It has been well documented (boy, has it ever) that newspapers are facing hard times. But it had not occurred to me until recently that not all is well in comic-strip land, either. Now, I just know Jeff doesn't keep a change of clothes at Mary's so where the orange suit and striped shirt came from will remain a mystery and probably has something to do with the Dharma Initiative. Say what you want about Jeff Corey's green suit of anger, I like his attitude! I thought Jeff was going for his gun when he reached into the green jacket of anger. But I didn't know who he was planning to shoot. Chester? Mary? Himself? 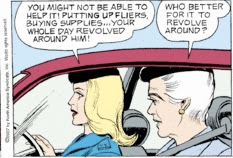 For the last two days, Mary Worth has been tormenting her boy friend, Dr. Jeff Corey, with innuendo about her new "male house guest," leaving him so enraged we could actually see his "!" over the phone. I can only assume, dear reader, Jeff slammed down the phone and has sped over to Charterstone to reclaim his woman. His twisted grin barely masks his insane, burning jealousy, which Mary, Ha-Ha, finds quite endearing. After the bodies fall, the joke sure will be on him. Ha Ha. The first indication that someone is an obsessive old lady dog lover is loss of eye hand coordination. Easy on the eyebrow pencil, there, Mary Worth! 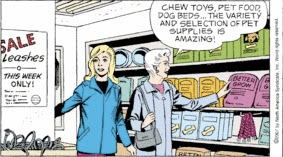 Of course you wanted to buy out the store, Mary Worth! It's Black Friday! It's Black Friday! Buy! Buy! Buy! Yes, Mary Worth, there is so much to be grateful for on this Thanksgiving Day. PetSmart, and their Pre-Black Friday sale is just one of them. As for me, Mary Worth, I'm simply grateful for you and all the joy you've given me this year. I'd say Mary's beginning to bond just as I'd hoped. But at unpredictably unhealthy levels! She's becoming disoriented and obsessed. But when the little child is reunited with Chester, we all know Mary's psychotic obsession will fade like Dawn Weston's obsession for Drew Cory. Do you think Mary will slap Chester a good one? You know, Mary. You can always get your own dog. Run, Chester, Run!! Run like Toto from the Wicked Witch of the West. 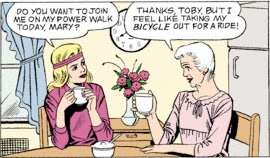 When Toby learned Mary was going to ride her bike down New Country Road, do you think she called a residents meeting and they planted Chester in the middle of the street with a mild sedative just to get Mary to stop meddling in their lives? When Mary finds out Chester really was a gift, she's going to go berserk. But for the moment, all of Santa Royale rejoices at this turn of events. The Houston Chronicle, long recognized for one of the best comics sections in the business recently hacked an entire page of comics. Mary Worth didn't stand a chance amongst such carnage. You can read all about it here. I'm doing all I can to restore Mary Worth to its rightful place of honor, but the Powers That Be just seem too heartless. You can leave a comment at Chron.com to protest! "Interesting. I've lived here since 1972 and I never knew that we could have dogs." Now that the word is out, I'm sure everyone will want one. Up until now, dogs have been as scarce at Charterstone as people of color. We'll start with dogs and then add an Asian family. One step at a time. One step at a time. I love that in panel two, Mary is still feeling passive aggressive, even though everything is fine. And how she speaks for the entire population of Charterstone. Just because it wouldn't work for her, she assumes it wouldn't work for everyone. Just wait until the 2 a.m. barking begins, then we'll see how the neighbors feel about pets! Oh, right, now's a great time to ask. You had all yesterday afternoon to review your condo by-laws and association rules, but let's wait until you get Chester home, have him sitting on your living room carpet wondering when you're going to stop carrying around those new dog dishes and give him some food. But don't worry, I'm sure the board will think Chester is adorable, agree that you're the Canine Good Samaritan, and allow Chester to stay as long as you put down lots of newspapers. Sadly, there may not be many Mary Worth cartoons in those papers as this fine strip continues to be ousted by editorial boards in an effort to attract younger readers. So, they drive out their older readers to attract younger readers who aren't going to read the newspaper anyway? Oh, yes, Boards are always so smart and reasonable aren't they. 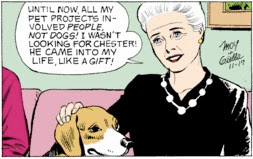 You should have no problem, Mary Worth, getting them to let Chester stay. Mary, in that book you're reading, did anything in the title even remotely suggest that you might try looking for the little children who lost their dog - er, excuse me: Your dog? However, I can't find a character named Chester in it. The dog in this book is named Cooper, or Lloyd, or something like that. We shall see if a Mary Worth endorsement carries the same weight as the Oprah Book Club. We shall see. Toby said New Country Road was a good place for thinking. You could make a fortune renting thought balloons and bicycles to tourists here. The road goes on and on and on, just like Mary's thoughts about how wonderful she is. But is Mary actually convinced that she's somehow met her good-deed quota for the day? She really has no idea who she is, does she. What would happen if Mary came across another wounded animal lying in the road right now? Would she keep riding back and forth to Spot 'n Boots Animal Hospital with wounded cats, squirrels, opossums? Of course, she doesn't have the basket anymore so maybe that will be her excuse for passing on the other side of the street. "Next time I'm bringing my Harley to the Canine Kingdom and returning as Emperor!" 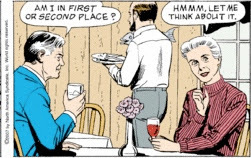 Awkward parallelism, Mary Worth. I believe you meant, "Is this mission of mercy or idea of wackiness?" Regardless, does anyone know how long it might take Mary to nurse the dog back to health, bond with the dog, realize it doesn't really belong to her, track down the rightful owners, and see the joy on the children's faces when she returns Dog in a Basket to them? Oh my gosh! A veterinarian who can actually quote the titles of James Herriot books! Who'd have ever dreamed? Tomorrow he continues, "All things bright and beautiful, All things wise and wonderful, The Lord God made them all, Every living thing." Catchy. Someone ought to put that to music or something. "Yes, I'll return in the morning, but let me go ahead and leave a blank check for you to write in whatever amount you want. Ah, heck, go ahead and take my Mastercard." Tiny Cat Lover Lady is hilarious! I hope they make her a major character. Sadly, I think her size is unintentional. The depth perception in this picture is so bad, I lose my balance just looking at it. 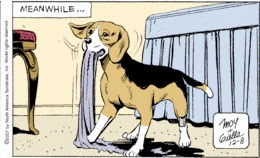 I think calling that beagle innocent is awfully presumptuous. He's a dog. Chances are there is nothing innocent about him. Thankfully, the most unusually named animal hospital ever is nearby. It took me a bit of research, but I finally discovered that the name has nothing to do with the blood spots on the carpet from the many beaten and boot-kicked animals that are brought there. Rather, it is named for the substantially large endowment the hospital received from those very famous animal philanthropists Spot and Boots. Despite Mary's belief in the innocence of animals and the dire medical attention required by this one, she spends 47 minutes removing the wire basket from her bicycle rather than just picking the dog up and carrying him inside in her arms. When it comes to dog germs, one cannot be too careful. I can go in so many directions with this one, so many directions. But don't worry, dear reader, this remains a family friendly blog. So, Mary's risky bike ride down New Country Road continues. Even when she's only thinking, Mary is lecturing. Gosh, what it must be like to live inside that head. Pooping all over the yard is fun. The fuel line for my grill is edible. You actually can dig up the carpet. But the one thing I actually did learn? Being black listed by the local animal adoption agency for returning their dog really isn't such a bad thing. Crazy Hillbilly Dog Lover wandering down lonely New Country Road on Halloween scares the daylights out of me. Toonhead over at the Comics Curmudgeon posted this delightful salute to the awkward movements of all the deadly weapons living at Charterstone. I had to share. Ah, yes, New Country Road. Except for the beheading last year, and the occasional gathering of Satan worshipers, New Country Road is a wonderful place for a 60-something widow to take a bike ride. Alone. Happy Halloween. What in the world? What planet do you live on? Vera may still love Drew, but if you think smiling about the fact is appropriate (if you call that a smile; it's really more of a maniacal meddler's grin), you may want to re-evaluate your feelings about love addiction, emotional abuse and co-dependency. Even Dr. Jeff, whose familiarity with romance is nebulous at best, chokes on his mug of warm cocoa (wink, wink) at the thought that after five months of this storyline, we can look forward to more Vera and Drew sometime in the future. I know it may be too early to predict, but something tells me that any future Vera/Drew story line will involve another pool party. Uh-oh. This means one of two things: The story continues as Vera and Drew reconcile and somehow manage to make their relationship work despite the fact that Vera is as appealing as blanched beef and Dr. Drew Corey is a self-centered jerk. Or, if my Mary Worth instincts are correct, this panel is actually the resolution of the entire story line! Those of you who are new to Mary Worth might find that hard to believe, but we have seen less thrilling climaxes. Vera, here are a few other ways of seeing the stars that I recommend.